DUBLIN LORD MAYOR Nial Ring has defended his decision to host an event for an unregulated crisis pregnancy agency at the Mansion House. Ring, an independent councillor for the North Inner City, did not respond to requests for comment from TheJournal.ie and other news outlets yesterday, after news of the gathering first emerged on social media. “Last Saturday, in my capacity as Lord Mayor of Dublin, I hosted Gianna Care volunteers in the Mansion House. I was happy to do so. He said he was impressed by the kindness and care they provided and had been happy to meet with the group. Gianna Care, which has a location on Upper Dorset Street in Dublin, has been criticised by pro-choice groups for giving inaccurate medical information. In an undercover report in 2017, a journalist with The Times (Ireland Edition) who visited the organisation’s Dublin premises was told that all women regret their abortion. TheJournal.ie, speaking to the mayor at an event in Dublin this afternoon, asked whether he was aware of that undercover report or of criticism of the organisation for giving women incorrect information. He said he was not. “I’m a male obviously so I don’t know if all women regret their abortions. As I said in my statement the connection and the experience I had of Gianna Care was a caring connection with girls who are in crisis pregnancies. A study published in the British Journal of Obstetrics and Gynaecology in 2016 which examined the experiences of women in Ireland who had accessed abortion pills online found that 97% felt they had made the right decision. A major US study published in 2015, which followed 600 women over three years, found that more than 95% said they did not regret having an abortion. Responding to criticism of the Gianna Care event today, Ring said that more than 22,500 people had been through the Mansion House during his term of office so far. Within that number, he added, “you’re going to get some people disagreeing with different groups I’ve had in, and that’s the great thing about democracy we can disagree but we can respect one another’s views as well”. Asked whether he would be happy to welcome, for instance, a group from Together for Yes to mark the first anniversary of the Eighth Amendment referendum in May, he said that the local elections were coming up at the end of that month “and I’d say I’ll be out canvassing in May anyway but look I’d look at any request”. Everyone, every citizen of this city, this great city, is welcome into the Mansion House. The mayor has been coming in for criticism from fellow councilors over the decision to host the group. “I totally agree with the mayor that anyone finding themselves in a crisis situation should receive help and support that matches their personal choices,” Tina McVeigh of the People Before Profit Alliance said. “The city voted overwhelmingly to Repeal the Eighth Amendment last year and in doing so rightly extended help, support and services to all women no matter what their personal choice was as to whether to continue, or not, with a pregnancy. “All women have the right to choose and all women have the right to a service that provides them with factual, accurate and timely information. I would be very concerned about the integrity of an organisation that has been found to give false and misleading information to women in crisis situations. This causes harm. Éilis Ryan, a councillor for The Workers’ Party in the North Inner City, said Gianna Care’s “anti-choice views” were in line with the mayor’s own politics “and so the incident is not surprising”.“What it shows up starkly is how anti-democratic our current local government system is.“The position of mayor is rotated between parties who sign up to an untransparent governing ‘pact’ which lacks any commitment to political common ground or standards. I refused to sign up to this pact. Those who did vote in the Lord Mayor should be held accountable for their choice. 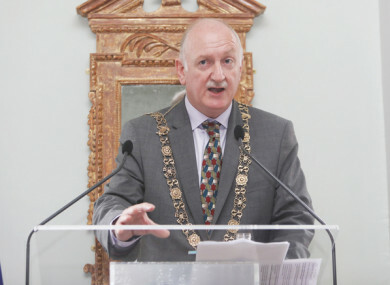 Ring became the 349th Lord Mayor of Dublin after a council vote last June, and was all-but-guaranteed the role due to a formal pact between Sinn Féin, Labour and an independent grouping to rotate the mayorship. He has served as a councillor since 2009. Email “Dublin Lord Mayor defends hosting gathering for unregulated crisis pregnancy agency ”. Feedback on “Dublin Lord Mayor defends hosting gathering for unregulated crisis pregnancy agency ”.